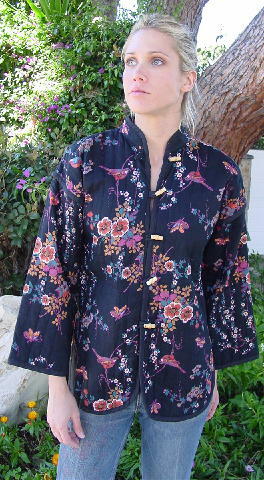 This vintage Asian style jacket has a black background. It has vertical stitched 1" sections that give it a quilted effect. The really nice black shiny fabric lining also has the same quilted effect. It fits a size 4 or 6 comfortably. It has a mandarin collar, long sleeves, and 5 natural wood toggles on one side with 5 fabric loops on the other side. The fabric tag has been removed, but the outer fabric feels like a cotton. It has rounded bottom edges and 7" long side seam slits. There is a butterfly, bird, and floral pattern in teal blue, antique cream, hot pink, curry, orange, white, blue-gray, cocoa, and black. 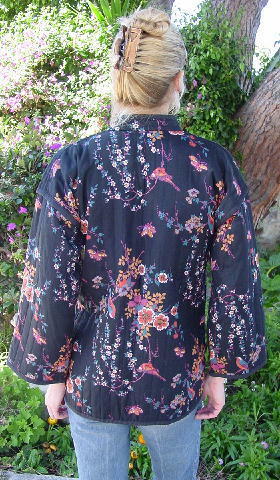 The sleeves have an inset look with a 3/4" shoulder-armhole overhang. There is a black 12" wide cord piping around all of the edges. 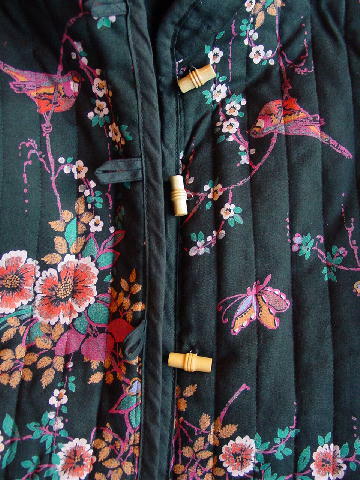 It's nice fabric (inside and out) and detailing. It was one of Eden's jackets. She picked it up at a vintage shop in San Francisco. shoulder to end of sleeve 17 1/2"